Ryanair has warned jobs could be lost as it cuts the number of planes stationed in some of the countries where it faces strike action. It made the threat as first-quarter profit slumped by a fifth amid rising oil prices and employment costs, including a 20% pay increase for pilots. The Irish low-cost carrier said profit fell 20% to €319m (£284.8m) in the first three months of its financial year to 30 June, compared to a profit of €397m in the same period a year earlier. Ryanair, which was forced to recognise unions in December for the first time in its 32-year history, is facing strikes in many of the countries it operates in over pay and conditions. Over 300 flights have been cancelled from its daily schedule of 2,400 on Wednesday and Thursday. While we continue to actively engage with pilot and cabin crew unions across Europe, we expect further strikes over the peak summer period as we are not prepared to concede to unreasonable demands that will compromise either our low fares or our highly efficient model, the company said. 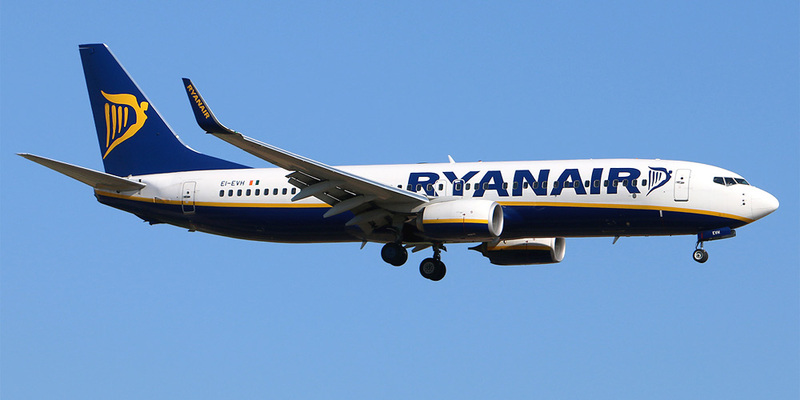 Ryanair said if these unnecessary strikes continue to damage customer confidence and forward prices/yields in certain country markets then we will have to review our winter schedule, which may lead to fleet reductions at disrupted bases and job losses in markets where competitor employees are interfering in our negotiations with our people and their unions. We cannot allow our customers flights to be unnecessarily disrupted by a tiny minority of pilots. First quarter staff costs increased by 34% primarily due to pilot 20% pay increases, 9% more flight hours and a 3% general pay increase for non-flight staff, the airline said in a statement. It has also been forced to cancel more than 2,500 flights due to air traffic control staff shortages in the UK, Germany and Greece and strikes in France, which added to its costs, the company said. Ryanair said Fuel prices have risen substantially from $50pbl per barrel at this time last year to almost $80pbl in Q1. While we are 90% hedged at $58pbl our unhedged balance will see our full year fuel bill increase by at least €430m. Ryanair's stock fell more than 5% in early trading as it warned average fares would lower than expected during the summer due to increased competition and strikes. They ended the day down nearly 7%. Holidaymakers are facing a third day of travel misery at Stansted Airport after storms grounded flights earlier this week. Thousands have been hit with flight cancellations and delays so far. The disruption is set to continue, with frustrated passengers this morning complaining of long queues and cancellations on social media. A spokeswoman for Ryanair said there is a very small number of delays and cancellations on Sunday as a knock-on effect from extreme weather and disruptions arising from air-traffic control staff shortages in the UK, France and Germany. Thunderstorms across Europe forced the budget airline to cancel flights at the London travel hub on Friday night and into Saturday. It came as thousands of holidaymakers suffered travel disruption over the extreme weather, with long delays for ferries and cross-Channel trains. Temporary flight restrictions were put in place during the storms across Europe on Friday sparking delays at Stansted. Luton Airport and Gatwick Airport on Saturday also warned of delays and cancellations due to thunderstorms in Europe, advising passengers to contact their airline for travel information. Mr Calder said passengers travelling to and from Stansted with Ryanair have been the worst hit. Ryanair cancelled about 50 flights on Saturday, and gradually the number of cancellations has been increasing on Sunday morning. Pictures shared on Twitter showed long queues to check in for Ryanair flights at Stansted this morning. One traveller claimed there were 200 people in a queue to rearrange cancelled bookings. In a statement, Ryanair said - Our UK operation is running well today. There is a very small number of delays and cancellations as a knock-on effect from the extreme weather disruptions on Friday and the disruptions arising from ATC staff shortages in the UK, France and Germany. Brits heading for summer getaways by rail and ferry also faced major disruption on Friday and Saturday,. People were left waiting for several hours to check in at the Eurotunnel at Folkestone amid extreme weather conditions. The cross-Channel rail operator blamed recent severe weather conditions for the delays. It said the service is running as scheduled with up to four departures an hour on Sunday. Meanwhile, there was heavy traffic around the Port of Dover on Saturday as families headed for the Continent by ferry. Passengers were told to expect long queues on the roads into the port, with a minimum two-hour wait to get through border checks. P&O ferries advised its customers to take plenty of drinks, snacks and entertainment for the wait. A spokesman for Stansted said the airport has been operational as normal today with no air traffic flow restrictions at the airport.